Theresa May has called a snap General Election on 8th June 2017. After the success of Action for ESOL’s London mayoral materials we have made a new pack of lessons to help ESOL teachers to bring discussion about the GE into the classroom and give ESOL students a voice in making demands on their future members of parliament. Based on feedback from the last set of lessons we have tried to make this pack more flexible. We do suggest you try the introductory lesson first but we hope you can dip in and adapt materials for your classes. We have provided the resources as word documents to make this easier. Please distribute these materials to all ESOL teachers you know in the UK and get in touch with any feedback or ideas that come out of your lessons. In the build up to the Mayoral Elections ESOL has been put back on the agenda by Cameron’s comments about the need for Muslim women to learn English. Action for ESOL thought it was important to bring this discussion into the classroom and give ESOL students a voice in making demands on their GLA representatives. We have designed a pack of 6 lessons to use by ESOL teachers in London to start the discussion in their classrooms. We also want to make sure that students know if they are eligible to vote and how to do it. We will use the ESOL students’ demands to lobby the Mayor and the GLA members over the coming months. Please distribute these materials to all ESOL teachers you know in London and keep an eye on the website for future events and activities. Join the Demonstration – THIS Wednesday 27th January 6pm Downing St! Restore Funding to ESOL: Don’t Scapegoat Migrants! UCU London Region, jointly with Stand Up to Racism, is calling an emergency demonstration next week on Wednesday 27th January at 6:00pm outside Downing Street. * Shakira Martin NUS Vice President FE confirmed speaker. - Free English classes for migrants and asylum seekers. We would like you to put ESOL classes on your manifesto and then make it a policy priority if you become the next Mayor of London. 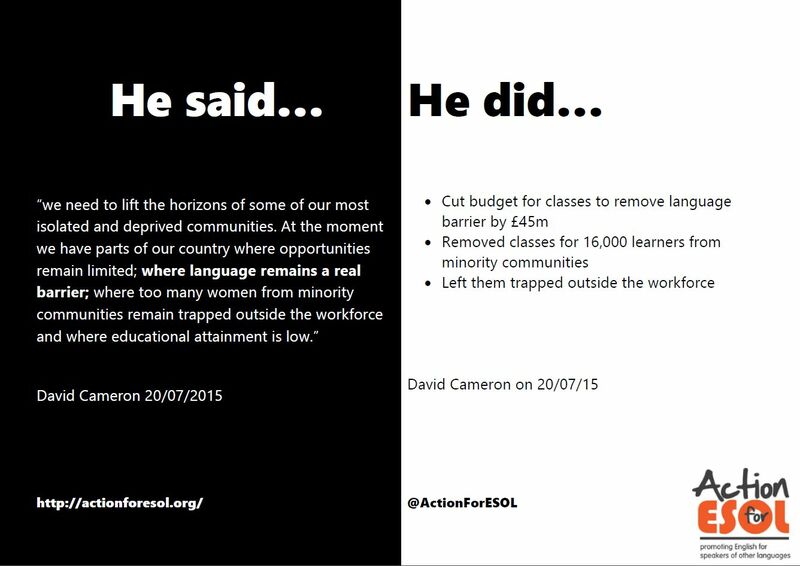 Funding for ESOL classes has been cut drastically by the coalition and current Conservative government. Demos suggest that there are 700,000 people nationally who have English-language needs and are unable to access classes; many of these people are Londoners. Why is ESOL so important to London? * Social justice and equality learning English gives everyone the opportunity to thrive in our city and play a full role in their local communities and society as a whole. * Democracy learning English enables people to participate in the political life of their neighbourhoods, their workplaces and their faith organisations and their community groups. * Young people learning English helps parents to support their children’s education. * Work learning English helps people to find work, progress at work and organise for their rights at work. * Does not scapegoat and demonise migrants. ESOL teachers across the country have joined together to tell David Cameron he is wrong to cut budgets for English for Speakers of other Languages (ESOL), that the £20 million for ESOL he proposes is a drop in the ocean. Since 2009 the overall Adult Skills budget that funds ESOL has been reduced by 35 percent which has led , to a drop in overall ESOL participation by 22 percent, disproportionately impacting women and ethnic minorities. Action for ESOL questions the commitment of Prime Minister David Cameron to promoting “integration” among migrant groups. Linking multilingualism to extremism is hypocritical and inflammatory, and stereotypes Muslim communities. Under Cameron’s premiership thousands of potential learners have been excluded from learning English. In 2015/16 alone, the Adult Skills Budget was reduced by 24% leaving thousands of learners with no access to classes. The sudden withdrawal of £45 million of ESOL funding this summer led to an immediate reduction of 16,000 learners for ESOL. Demand for ESOL classes continues to outstrip places available in ESOL classes. Hundreds of potential learners are being turned away by every provider. In 80% of localities, there are waiting lists of up to 1.000 potential students. Hackney Community College in East London alone has a waiting list of over 300 people, mostly women. Two thirds of ESOL learners are women. Funding for student support – including for childcare – has been eroded. The Governments own Equality Impact Assessment from 2011 on ESOL cuts, drew attention to negative and disproportionate impact on women that reductions in ESOL funding and provision would have. The effect is to leave women isolated. It is widely accepted that ESOL learners who do not have ESOL often have poorer health, housing and pay, and higher rates of unemployment. The opportunity to learn English is essential if migrants are to be able to participate fully in society. ESOL should not be linked to immigration status. It would be better to have more classes than break up families by deporting their mothers, this goes against the grain of everything we do as inclusive professional educators and for the demands of an equal society for all. Migrants to the UK are keen to learn English, the biggest obstacle to this is the drastic lack of classes caused by year-on-year cuts. Action for ESOL believes that ESOL for all refugees and migrant learners should be fully Government funded and supported by full outreach to all communities. We urge the Government to recognise the crucial contribution language learning makes to society as a whole. ESOL provision should be a statutory entitlement, not subject to the vagaries of disjointed funding policy. Cameron under fire over English language skills warning for Muslim women. * According to the Dailymail the PM’s proposal, the women would be expected to have reached the A2 – elementary – level after two-and-a-half years, and B1 – intermediate – after five years. Are David Cameron’s English lessons for Muslim women simply reversing his own cuts? Action for ESOL is holding a strategy day to assess the current situation and determine our next steps. Much has changed since the campaign was launched and we feel the need to take stock. Time and Date: Saturday 9th January 11 – 3pm and then lunch together (bring something to share if you can). Tea and coffee provided. - Pool our knowledge to do a power analysis of ESOL. Who has power to effect the change we want to bring about? How can we influence those people/groups? All of the activities will be facilitated using participatory tools that can be used in the classroom with students. If you would like to support with the facilitation please contact dermot@efalondon.org. Please come to this if you possibly can and if you can bring someone new to the campaign, even better! Refugees are beginning to come to London from the recent crisis. College education has a proud history of supporting refugees and the funding is there, but Government need to put the money back into quality education instead of a dumb downed version of cheap role play. Action For ESOL has written a letter to the Guardian in reply to their article entitled ‘After Wires and Fences, Refugees need help scaling the language barrier’. Volunteer based initiatives, like the Creative English programme, have a valuable role to play in providing opportunities for English language learners to practise English in a friendly, welcoming environment. However, your article seems to suggest that a respected sector of adult education could be substituted with untrained volunteers. This would never be suggested for maths or English for native speakers. In light of the threat to ESOL already posed by significant government cuts (over 50% of funding cut since 2009), such a suggestion is irresponsible. We are not surprised that the predominantly low level participants in the Creative English project reported gains in confidence. Practising English is likely to increase confidence. However, this project is focused solely on improving the speaking skills of low and intermediate learners. Qualified ESOL teachers, by contrast, are trained to identify and work with English learners’ complex language and literacy needs beyond the basics. Whilst being able to have a short conversation in a shop or speak to a health professional is vital for life in the UK, this understates the language and literacy skills people need to pursue an enriched life in the UK, one with opportunities rather than barriers. The Syrian refugee settlement programme is funded by central government. The same government that has awarded funding to ESOL projects staffed by volunteers, whilst slashing traditional ESOL provision. Ultimately, it will be refugee and migrant English learners who suffer. If the government is serious about helping Syrians resettle in the UK, then they should fund high quality ESOL programmes taught by experienced specialist teachers which allow students to develop competence as well as confidence. 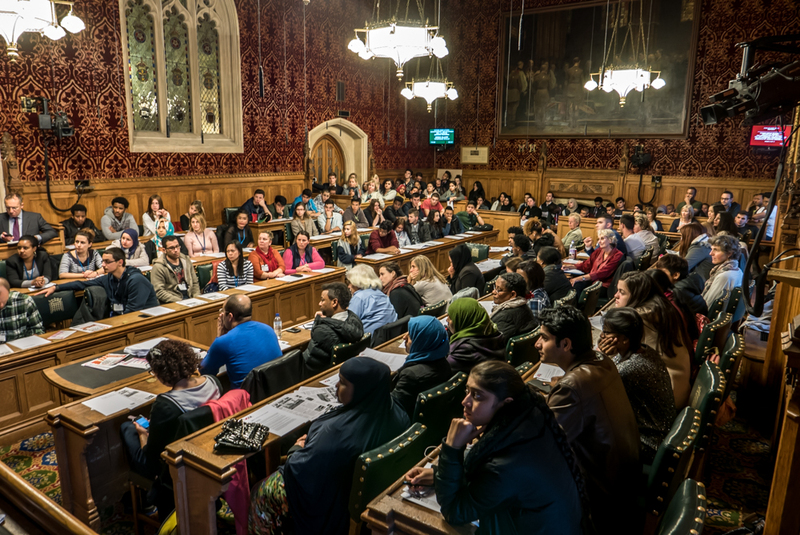 600-Strong Lobby Tells the Government to Fund ESOL and Adult Education! A big thank you to all for a great ESOL and Adult Education Parliamentary lobby yesterday, hosted by UCU London Region and Action for ESOL. 600 students, teachers and community representatives came from Greenwich Community College, ELATT (East London Advanced Technology Training), Barnet & Southgate, Ealing, Hammersmith, Lambeth, Hackney, Leeds, Brent, Tower Hamlets, Morley, Westminster Kingsway and City & Islington Colleges/ ESOl providers. It was a fantastic day. There was such a long queue outside waiting to get in that an impromptu march up up to BIS for a demo outside their offices also took place! The students were amazing, passionate, determined and not just demanding ESOL but a right to be here – to have “dignity”, as Rosa, a student from Hackney College, said. Mohammed, a student from Tower Hamlets, said he wanted “to speak English, I don’t want interpreter”. Nathaniel, ex-Lambeth College student and from the Eritrean Community Centre, spoke about the rights that ESOL learners wanted very eloquently, that ESOL is not just about language but about having rights to many other aspects of life. Jasmina from the Women’s Refugee Association spoke about why ESOL is important for women and for their families as a whole. From UCU London Region, Sean Vernell spoke about how immigration has been integral to Britain, and the fight for ESOL is about the fight for Adult Education as a whole. Once again the students, by coming in numbers, put ESOL and FE into the news! 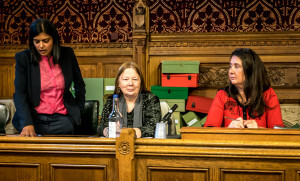 Many of the MPs who said they would come were called away to be at Prime Ministers Question Time and the vote on George Osborne’s Fiscal Charter, which committed Government to make more cuts! List of Labour MPs who abstained from voting against the cuts. Thanks to everyone who supported the lobby and came on the day. Now come to the next Action for ESOL meeting on Monday 9th November, 6.30pm, Morley College, to talk about what we do next. 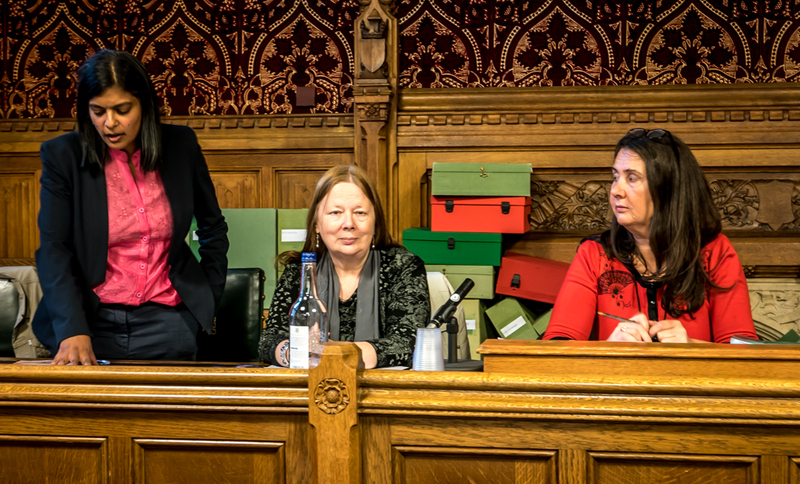 Adult Education & ESOL Lobby of Parliament – Latest speaker line-up and press info! Update re the Adult Education and ESOL Parliamentary Lobby – this Wednesday 14th October 12 noon start, finishing at 3pm. Flyer, map, materials, lobby times, green card info – all in our earlier post below. 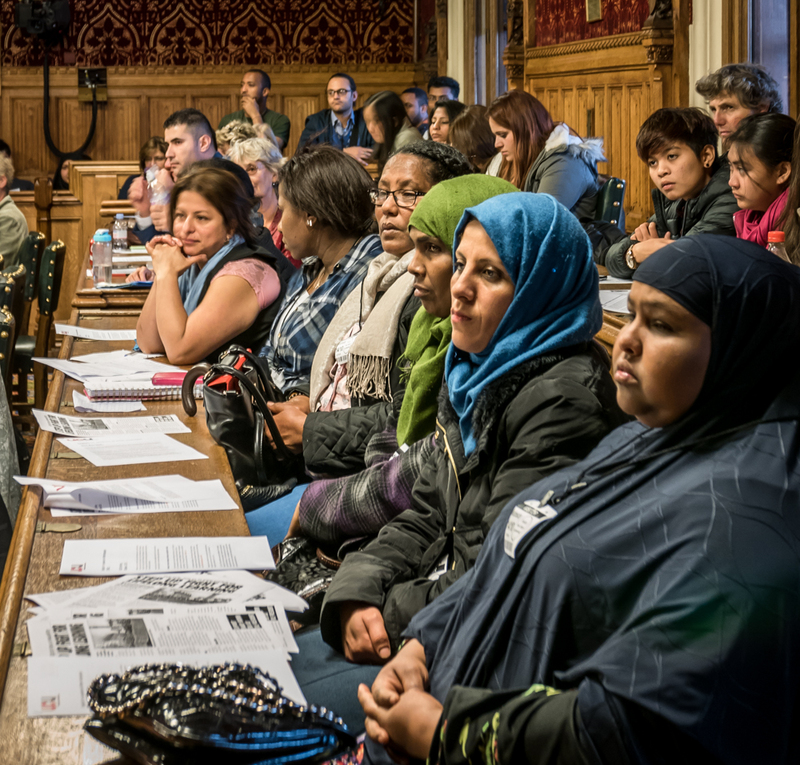 Download the ESOL briefing document English for speakers of other languages produced by UCU Head Office which has been emailed to all MPs along with the ESOL manifesto. Hard copies of both documents will be available at the committee room on Wednesday at the start of the lobby. Read and circulate the UCU press release and download the table of ESOL damage as a result of recent cuts from around the country. Download the calendar of upcoming events Action for ESOL Calendar of events which Action for ESOL will be mobilising for and sending speakers/ delegations to, including the next action for ESOL meeting on 9/11/15 at Morley College. Please circulate widely and see you on Wednesday!